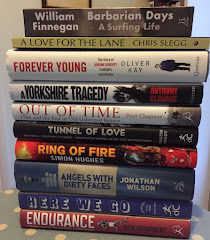 Racy tales of scandal and skulduggery and journeys into troubled souls have tended to tick the judges' boxes for the William Hill Sports Book of the Year in recent years, so it is encouraging to see that the 2014 shortlist contains two hefty tomes of thoroughly well researched sporting history. The reason for their presence there is easily explained: both are exceptional pieces of work with an appeal that goes well beyond mere academic interest. Rob Steen's Floodlights and Touchlines: A History of Spectator Sport weighs in at 531 pages of fairly dense type with only one pause for illustrations, which makes it at first glance a daunting prospect. Yet it has been hailed for the author's lightness of touch in tackling a subject of epic proportions, taking his readers on a journey from gladiatorial Rome to the present day that is heavy on detail yet with many diverting anecdotes. Played in London: Charting the History of a City at Play, Simon Inglis's latest contribution to a series of works on sports history by English Heritage, is simply sumptuous, a lavishly illustrated, beautifully written and staggeringly comprehensive history of sport in London and of the places it has been played, with a particular emphasis on sporting architecture, from stadiums to swimming baths, pavilions to boathouses. Steen, a former Guardian and Sunday Times sportswriter who is now a senior lecturer in sports journalism at the University of Brighton, is the author of a dozen books and many research publications and Floodlights and Touchlines is his most ambitious project. His decision to give the book a thematic structure was a wise one. Where a chronology might have challenged the reader's stamina, Steen chooses to break down his history into 10 chapters, each looking at a different aspect of the way sport has evolved. Gambling, governance, professionalism, players' rights, internationalism, politics, race and sexuality all come under Steen's analytical spotlight, as well as -- of course -- the part played in sport's history by the most important participants of all, the spectators. Steen's knowledge of sport is immense and his grasp of its significance impressive and enlightening, his appreciation of social and political context giving deeper texture to the story. He understands the dramatic qualities of sport and why so many of us find it so engrossing and explains it all in a compelling narrative that is destined to make this work a classic. Simon Inglis shares with Steen an enormous fascination with sporting heritage, with a particular interest in where sport has taken place. His books on the football stadiums of Britain and Europe have become definitive works, blending the history of the game with the evolution of its architecture. He also wrote a wonderful biography of Archibald Leitch, the architect responsible for turning Highbury, Old Trafford, Anfield and Craven Cottage into stadium that would become established in football's iconic landmarks. Played in London extends way beyond football to explore pretty much every sport ever played in any organised way within the boundaries of the capital, from archery and athletics to speedway and squash, seeking out what remains and what has disappeared among the vast number of grandstands and pavilions, gymnasiums and sports halls, boathouses, swimming pools, cricket, football and rugby fields and even skateparks that have helped London establish and maintain its reputation as one of the world's great sporting cities. Inglis takes the reader back in time as far as bull and bear baiting and cockfighting in the 16th century to explain the origins of streets such as Bear Gardens in Southwark and Cockpit Steps in Westminster, and explains how Pall Mall was once a section of St James's Park set aside for the French lawn game of Paille Maille, a variation on croquet. The wonderful photography, meanwhile, brings back to life some of the great landmarks now disappeared from the city's sporting skyline, notably the lamented White City stadium, originally constructed for the 1908 Olympics, that would play host to so many famous occasions in athletics, greyhound racing, speedway, boxing and football and the demolition of which in 1985 was an act of vandalism against not only London's cultural heritage but that of the whole country. Inglis's knowledge of and fascination with sporting architecture is unrivalled and his text is rich in detail, while the wealth of eyecatching illustrations brings every page to life. Played in London follows on from similar volumes on sport in Manchester - also written by Inglis -- Birmingham, Liverpool, Glasgow and Tyne and Wear in the Played in Britain series. A masterful piece of work, it is an absorbing and richly evocative history of sport in the great city and will be the definitive reference work for anyone wishing to embark on a tour of the capital's sporting heritage. To buy Floodlights and Touchlines: A History of Spectator Sport, go to Amazon , Waterstones or WHSmith. Likewise, buy Played in London: Charting the Heritage of a City at Play from Amazon , Waterstones or WHSmith.